A few years ago, my family and I spent two weeks on a summer vacation in San Clemente in Southern California and acquired a new vice. Every afternoon, we would stop at a frozen yogurt (FroYo) store in town and eat astonishingly large portions, secure in our misguided delusion that the “ healthy yogurt” would overcome the sugar and calories in the mix. When we got home to New Jersey, we scoured the neighborhood for FroYo stores and found none close by and only one within five miles. My kids suggested that I quit my day job (since they cannot believe that anyone would pay to hear me talk) and start a new store nearby, pointing to the untapped market potential. I am glad that I did not take them up on the suggestion, because that market gap must have been observed by others as well, some of whom took the next step and opened up stores. Today, my search on Yelp provides a listing of twenty five frozen yogurt stores within five miles of my house, a number far too large for the number of frozen yogurt fans in the neighborhood. As we drive by the sparsely filled stores, it is quite clear that a large number of these stores will not make it through the winter. This phenomenon of individual decision makers behaving rationally, given the information they have at the time of their decisions, but creating a collective irrationality is not restricted to frozen yogurt business. In fact, you often see it play out in the valuations of young companies in a market with significant growth potential. In the late 1990s, it was the promise of online retailing riches that drove the market values of dot-com companies to unsustainable heights. In today's market, we see this process repeated at social media companies, where as each new company enters the public market, the vast potential of online advertising is used to justify a lofty valuation. While each company’s valuation, standing alone, may be defensible, given the market potential, the question that is worth examining is whether the collective valuation of these companies is consistent with the size of the overall market. The basis for the macro story being told about social media companies is visible in this graph. 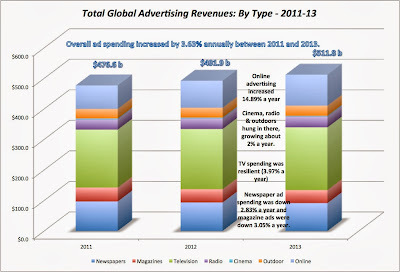 Advertising is growing as a business, driven by growth in emerging markets, and an increasing proportion of the revenues comes online. The biggest losers are newspapers and magazines, but television and other conventional outlets (radio, cinema & outdoor) have held up surprisingly well under the online assault. The prediction is that this shift to online advertising will continue into the future, though the rate of growth will slow down as online advertising becomes a larger and larger slice of total advertising. In the table below, I look at expected online advertising revenues (in billions of US dollars) in 2023, with different assumptions about annual growth in the market and the online share of that market. Thus, in the optimistic scenario for online ad spending, I assume that it continues to gain market share at the same rate as it did between 2011 and 2013 (to get from 19.83% today to 40% in 2023) and that ad spending grows at 4% a year for the next decade and arrive at a value of $303.04 billion in spending on online advertising in 2023. To assess what investors are anticipating as expected revenue growth in online advertising companies, I started with the current financials of the company and its revenues and operating income in particular. I then looked at the enterprise values of these companies, computed based upon current market capitalization (market value of equity), debt outstanding and current cash/investment balances. If you are willing to make assumptions about the target operating margin of the company (whether it will be higher, lower or equal to the current margin) a cost of capital for the firm and how much you will need to reinvest to grow (sales to capital ratio, in my model), you can then solve for the imputed revenues that you will need in year 11 (2023) to justify today’s market capitalization. Thus, with my assumptions, the imputed revenues in 2023 for Google will have to be $168,336 million to justify today's market value. Clearly, if you change my assumptions about operating margin, cost of capital and sales to capital ratio, you will get a different imputed value; decreasing margin & sales to capital ratio and increasing the cost of capital will all push up the imputed revenues in 2023. If you are interested, you can download the spreadsheet which contains Google’s numbers and change the inputs. I used this spreadsheet, with standardized numbers (cost of capital of 10%, sales to capital ratio of 1.50 and a target operating margin of 25% for most of the companies, to get imputed revenues for all of the publicly traded companies in my social medley list. The table below summarizes the imputed revenues for an incomplete list of companies that derive their revenues from online advertising, with four large non-US companies thrown into the mix. All of the break even DCFs area available in this folder. It is true that not all of the revenues at each of these companies is from online advertising. Using the most recent annual reports, I estimated the percentage of overall revenues from advertising and backed out the portion of the imputed online advertising revenues keeping that percentage unchanged. If you add up the imputed revenues across companies, the total online advertising revenue across just these companies of $319.2 billion, higher than my estimate of the overall online advertising market in 2023. Note that I erred on the conservative side in my assumptions to generate lower imputed revenues; shifting to a 12% cost of capital for all companies increases imputed revenues in 2023 to over $400 billion, as does using a target operating margin of 20%. Given that there are other online advertisers that have not been counted in this list, that there are a whole host of private companies like Pinterest and Snapchat waiting in the wings, ready to go public, and still more brewing in the fertile imaginations of creative people somewhere, it is safe to say that the market collectively has a macro problem that is difficult to explain away. Social media companies are collectively over valued: As in other young sector booms - PC companies in the 1980s, dot-com companies in the 1990s - the market seems to be getting the macro story right but the micro valuations wrong. Diversification as a strategy may be a good one in sectors where the law of large numbers work in your favor, but not in sectors like social media, where you have "bias upwards" in the valuations. A social media ETF may be a good momentum play but it is unlikely to be a good investment. One or two of them will be the winners over the next decade: If you are an investor with a social media company in your portfolio, is that investment doomed? Not necessarily, because while these companies may be collectively over valued, there will be winners among these companies that will emerge as the sector matures. Using the dot-com sector as the template again, an investor in Amazon even at the peak of the boom in January 2000 would have little to complain about today. The key to investment success in this sector then becomes tagging the winners early in the process. While Google and Facebook are the early leaders in this race, those standings will change as technology and customer behavior change over time. The valuations may be put at risk if entry into this business is “easy”: The PC business from the 1980s should offer a cautionary note for investors who assume that a market that is growing fast will also deliver high value to investors in companies in that market. If the barriers to entry are low, you can have high revenue growth in conjunction with low margins and little value creation. Less macro story telling: As investors, we should be wary of story tellers, who use the same macro argument (the online ad market is getting bigger, there are a billion people in China) to justify one company valuation after another. Stories are a useful starting point but they have to be linked to specifics. Longer time horizons: While I understand the desire of analysts to frame their assessment of companies around the near term (next quarter’s earnings, next year’s revenues), you have to attempt to look at where the firm will end up over the long term. (I use ten years, but it does not have to be that long). It is tough to introduce any macro discipline in your thinking with short time horizons. Winner and Losers: If we start off with the presumption that the pie, defined broadly (as advertising and not online advertising), is limited, high revenue growth for one company often has to come from competitors and it behooves us to be explicit about winners and losers. For instance, in my Twitter valuation, where I estimate revenues will grow from $448 million right now to $11 billion in 2023, I should have tried to explain how much of this additional revenue will come from old-world media (newspapers, magazines, cinema), how much from other online advertisers (Google, Facebook) and how much from growth in the market. Transparency: While revenue growth and operating margins are both critical inputs into valuation, they are interconnected and often require that you look at trade offs. Thus, going for higher revenue growth will generally mean lower operating margins and the net effect can be positive or negative. It is easy to develop tunnel vision when valuing companies and forget that the rest of the world does not remain static, while the company being valued plots its path to success. Unless we consciously step back and look at the big picture, we will continue to create micro valuations that don't up aggregate to create viable macro environments. Professor, you may be onto something here, but this analysis has some flaws. I'll even concede that plenty of the online ad companies are overvalued. But I have some issues with your figures. 1) Your margins for Google are low - you are including the losses from Motorola, a non ad business. Google breaks out it's core business, more like 30% margins. Secondly, on Google, you ignore that its fastest growing segment, L&O (growing ~140% a year), is not ad revenue, so Google's % of revenue from Advertising will not be as high in 2023 as you show. 2) Your Facebook target margin is also too low. Margins will be higher once investing for growth slows. Especially once Instagram starts to monetize. 3) The vast majority of Yahoo's Market cap has nothing to do with Yahoo's ad revenue, but instead its stakes in Alibaba and Yahoo Japan. Back those out, and Yahoo's core Enterprise value is well under $10B. 4) Not even close to 80% of LinkedIn's Revenues are Ad related. The Talent Solutions business is not Advertising. Recruiter seats and job postings are not advertising. It's more like 25% of their revenue. If you count 80% of LinkedIn Rev as advertising, you'd have to count temp agencies, corporate recruiters, and the entire HR department of every organization in the world. 5) AOL margins are being dragged down by the Patch Network (which they are downsizing). Margins should be higher after that. 6) Yelp (which I agree is overvalued), has run up, largely due to their addition of transactional services, like delivery. 7) I guess this is debatable, but I don't view OpenTable as advertising. Also, the margins assumption for Opentable is too low. Not really a needle mover for this analysis though. Granted, you don't include plenty of other companies with online ad revs, but you have flaws in the 4 of the 5 largest Ad Rev and market cap contributors - which makes the conclusions fuzzy, imo. Prof, for Google, the marginal tax rate has stayed at 24.21% in the spreadsheet instead of 40%. This might have some effect on the output. 1. I agree. Raising Google's margin does bring down the imputed revenue, though raising the tax rate over time has a partially offsetting effect. 2. On Facebook, I am not sure that margins will be higher. As growth slows, Facebook will try harder for more growth which tends to drag down margins. 3. You are right. Lowers the imputed revenues for the company. 4.On Linkedin, I did go back and forth on this one and your point is a good one. 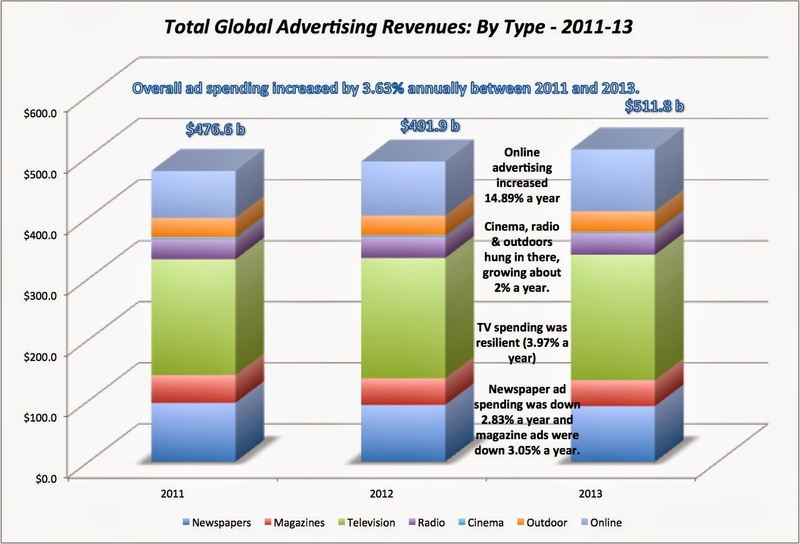 This revenue is not from the ad business but primarily from the manpower business. 5. We have been waiting a long time for AOL to post higher margins. 7. I did go through the same debate on OpenTable. I am not sure. If I get a chance, I will rerun the number with these changes and see how the aggregate value shifts. This has little to do with population but more to do with a different constraint. 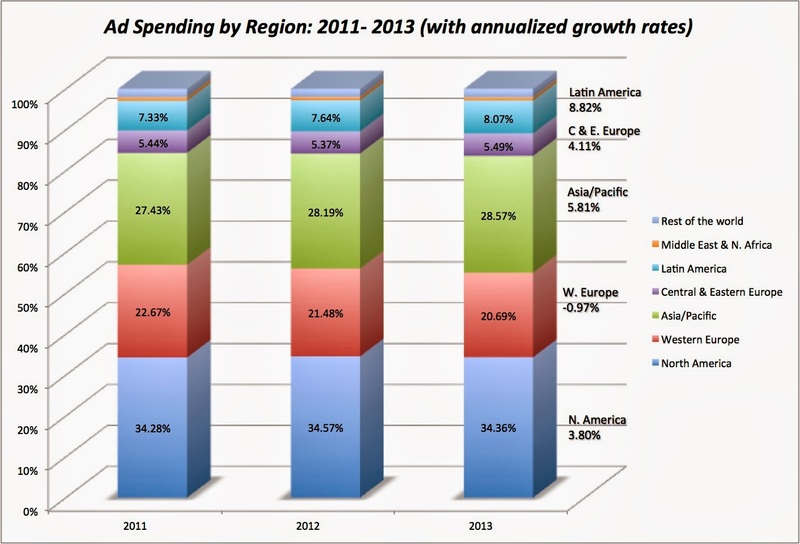 Advertising revenues come from companies spending money on advertising and those budgets are not unconstrained. Put differently, you can make all the arguments about people getting online but if companies don't have money to spend on advertising, the story does not go very far. Prof. Damodaran's analysis is conservative. There are thousands of other content providers fighting for advertising dollars. For example, Apple just launched iTunesRadio, where a minimum ad buy is $1 million at this point. Don't forget about advertising on Amazon.com (website and Kindle) or eBay, not included in these calculations. This long tail of online advertising will add up to a very significant number. I want to pose a question pertaining to the second point in the implications section in your blogpost. I don't understand why you use EBIT instead of EBITDA in calculating FCFF. As EBIT does not include depreciation and amortizatoi, your method reduces the firm value. FCFF/Revenues should be larger than your forecast in Google and Tesla's valu, in my view. During year 5~9 in projection of Tesla, you assumm negative cashflow of $4.4~1.2bn with good operating margin of 5.4%~11.0%. This seems unreasonalbe as a company with OP marign 5~11% is supposed to generate positive cashflows. There was an interesting quote recently about the dot com era in which valuations were driven at the time by "eyeballs" (i.e. online users who see a page) where as the real focus needs to be on how the websites generate their revenues from the paying companies, as mentioned in this article. Seems to be another one of the stories backing some of these valuations. It will surely be interesting to see who the winners and losers are in the coming decade. There's one stock named Balmer Lawrie & Co. listed on indian stock exchanges...people are valuing the share to about Rs.1000 per share when on the stock market, its mere Rs.300. I personally valued it to Rs. 231 per share. There's a hell lot of difference and I cannot understand why...would you...if possible...please value the stock in your way? I do not see any but the largest of firms relying on significant online ad revenues maintaining a 25% margin. Social media has very low barriers to entry and you can go from #1 to Blackberry very quickly if the retail consumer no longer perceives you as "cool." Consumer tastes change quickly in tech. Consider that my young cousin has already told me Facebook is "for old people." The social media companies that will last (and maintain margins) are those that will use their early success to diversify into higher margin lines of business, IMO.